A few weeks ago I showed you my homeschool planner, but today I wanted to talk about finding the time to do it. It is easy to say we'll plan and prepare, but when there is a toddler slinging to your knees, a five-year-old on the verge of tears, a nine-year-old begging for electronic time, and a growing reminder that a newborn is on the way, how do you do it? 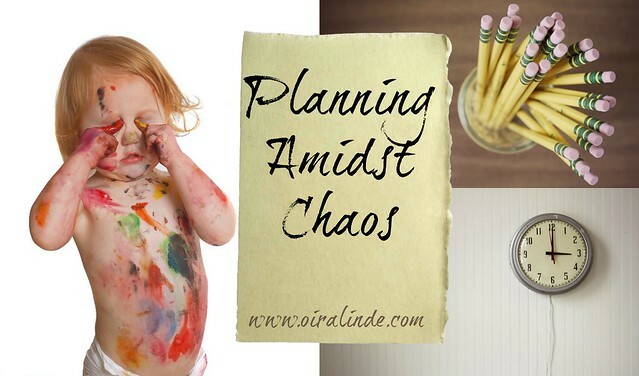 Where do you find time to plan amidst chaos? Planning for our homeschool and for the week is the only way I can stay sane. When I plan for the week I know exactly where we are going, what cleaning jobs need to be tackled, what chores need to be dished out, what meals we are eating, and it cuts down on time in school because everything is laid out and I don't need to figure out where we are and what we are doing. Planning also helps me make sure I have everything I need which reduces the amount of trips to stores. Honestly, if I didn't plan out my life I would be cranky and nothing would get done. It's the only way to make it as a homeschooling mama! I have two planners. First, I have my homeschool planner which I use to keep all our homeschool information, co-op information, lesson plans, etc. organized. Every weekend I go over what we have done and transfer lessons into my planner. I do use curriculum that has lessons and make it easy for me, but I like having all the plans in one place so that I don't have to flip through books. My other planner is my life planner. In it I have monthly and weekly schedules that have our appointments, birthdays, chore assignments, meal plans, and more in it. In order to get through my week, the planner is necessary. It tells me where I go, what to do each day, and what to cook! I also spend a weekend night working on the next week's layout. I enjoy making it pretty and it becomes a cathartic release to be creative with my planner. This is the kicker. Right now, I am able to get all the kids in bed and I have a couple hours at the end of the night to organize and plan. This time is at the end of a chaotic day. It is very important to me to have this time to decompress and plan after we were running around ragged all day. That is about to change. We are having a baby (due in September) and my evenings will be filled with a colicky baby. How do I plan to adapt to a new schedule and change in routine? I plan on asking for help. There is no crime in asking for help. I have a husband. He can take a baby for an hour while I plan my week. He can take the baby for a drive or feed him a bottle so that I can take a moment to find my planner peace and make sure I am ready for the upcoming week. I think it will be even more important to take this time after the baby comes because adding another family member will create more chaos in my day. Planning and following through will be important to keep my calm amidst the chaos of having a young family.